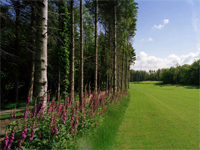 The golfcourse boasts some of the UK's finest scenery, a mixture of mature wooded areas, wide and narrow fairways and vast water and bunker features, all set in the spectacular countryside of Wales, with its abundance of wildlife including badgers, swans, rabbits and hawks. The par 73 Wales National golf course, opened in June 2003 by Great Britain Olympic gold medallist Sir Steve Redgrave, has already played host to several European Challenge Tour and Seniors Tour events as well as some for the Europo Tour. The golf course was also the venue for the Sky-televised FIRSTPLUS Wales Seniors Open and SWALEC Wales Challenge. Other golf facilities include a 20-bay all-weather floodlit driving range and expert tuition from 3 of Wales ' leading golf coaching professionals. Add to this a friendly and welcoming golf clubhouse, a well-stocked pro shop and it's easy to see why the Vale has become one of the UK 's most popular golf destination resorts.